Development Impact Fees | TischlerBise Inc.
TischlerBise has calculated over 900 impact fees/excise taxes throughout the United States and Canada more than any firm in the country. None of the firm’s impact fees have been successfully challenged. These one-time fees, used to fund capital improvements needed to accommodate new development, have become increasingly popular with local governments. Not sure which categories merit consideration for impact fees in your jurisdiction? Try our impact fee feasibility analysis, typically priced under $10,000. It serves as a road map for your jurisdiction and a white paper to help inform others. Capital facilities for which TischlerBise has calculated impact fees for include: sewer, water, schools, roads, drainage, electricity, police, fire/EMS, law enforcement, fire protection, parks, municipal/public buildings, stormwater facilities, municipal power, and libraries. The City of Goodyear, Arizona, desired two sets of geographic-based development fees. The City wanted to update its existing development fees for current areas of the City as well as new development fees for the recently annexed 67 square miles in the Sonoran Valley area. Additionally, the City’s previous development fee updates had been tumultuous. TischlerBise was hired to help standardize the City’s development fee process. To better meet the legal requirements of “rational nexus” and maximize the fiscal benefits of the development fees, TischlerBise calculated two separate sets of Infrastructure Improvement Plans (IIP’s) and Development Fees for these two areas of the City. The following categories of infrastructure were included in the analyses: water resources, water development, wastewater, reclaimed water, libraries, parks and recreation, fire, police, general government, public works, arterial streets, and regional transportation. For the Sonoran Valley area, the development fees reflected that solely new development created the demand for additional infrastructure capacity. The Sonoran Valley fees also included the additional financing costs the City would incur to build infrastructure in this area. Pinal County is the fastest growing county in Arizona and one of the five fastest growing counties in the country. The County initially hired TischlerBise in 2006 to calculate transportation development fees. The County subsequently retained TischlerBise in 2009 to update our original work, and has recently hired us for a third time to conduct a 2014 update. Trip Generation Data and Analysis: The Institute of Transportation Engineers, Trip Generation Manual, 8Th Edition, 2008 was the source of average weekday trip generation rates as well as pass-by trip and diverted link percentages for commercial land uses. In addition, TischlerBise developed unique pass-by and diverted trip link adjustments for medical-dental offices using the questionnaire from Figure 5.17 of the Trip Generation Handbook, 2nd edition, an ITE recommended practice, June 2004; Institute of Transportation Engineers. Travel Demand Database Forecasting Modeling: TischlerBise created a traffic demand model that was used to determine demand on the County’s network from new and existing development. Using development projections and projected lane miles needs for each impact fee area (IFA), average trip lengths were then calculated for each area. Data Collection and Analysis for Transportation Infrastructure: The County’s adopted Regionally Significant Routes for Mobility and Safety served as the basis for determining the capital improvements to be included in the impact fees. In collaboration with County staff, TischlerBise allocated planned projects to each of the County’s seven IFA’s. When considering projects for inclusion in the transportation Capital Improvement Plan (CIP) for each IFA, TischlerBise used two methodologies: the marginal cost approach is used for projects that are the result of new development only, while the average cost approach is used for planned capacity improvements that result from both existing and future development. Land Use Classifications: Given its size and varying development patterns, Pinal County experiences a more diverse assortment of land uses than a municipality or suburban community. TischlerBise provided an expanded impact fee schedule that included additional land use categories for industrial, office, and institutional development. Roadway Level-of-Service Analysis: The impact fee calculations utilized the County’s planned level-of-service. TischlerBise also evaluated the existing level-of-service to ensure that new development was not being assessed at a higher level-of-service than what was currently being provided to existing development. Impact Fee Credit Allocation/Analysis: The County’s primary sources of funding for transportation include gas tax revenues from the state (Highway Users Revenue Funds, or HURF) and a dedicated half-cent sales tax. A credit was not considered as these revenues are used for maintenance needs. Transportation Impact Fee Ordinance Reviews: TischlerBise provided assistance and feedback to the County’s attorneys during their preparation of the impact fee ordinance. Impact Fee Benefit Area Analysis: Pinal County encompasses 5,400 square miles. To better plan, coordinate, and finance the planned infrastructure demanded by new development, the County established seven IFA’s in the unincorporated County. Conduct Public Meetings/Workshops: The project included an extensive outreach component involving several public meetings in different areas of the County with the development community. A total of six public meetings were held between June 2009 and adoption of the updated fees in February 2010. TischlerBise recently completed a development impact fee study for the City of Tulare, California. Fees to cover new development’s share of capital facility and equipment costs were calculated for the following categories: police, fire department, water, sewer, general government, public works, libraries, and road improvements. Unique aspects of the Tulare Development Impact Fee Study are the progressive residential fee structures that promote equity and housing affordability and customized vehicle trip generation rates by size of housing unit. TischlerBise was retained by the City of Boulder, Colorado, to review and update our original impact fee study for fire/rescue, parks, trails, police, general government, and libraries. In addition, TischlerBise updated our original Transportation Excise Tax methodology, which required voter approval. In the update, TischlerBise prepared the impact fees and excise tax using progressive housing multipliers (i.e. the fee increases with the size of the dwelling unit). The primary reason for this approach was to promote housing affordability. Because any change to the City’s current Transportation Excise Tax required another referendum, TischlerBise worked with a citizen/developer Liaison Committee throughout the study process. The City of Boulder also contracted with TischlerBise to prepare a transportation maintenance fee methodology. The establishment of a transportation maintenance fee to address transportation needs not only allows a jurisdiction to address the funding of capital improvements but also provides revenue to cover the cost of operations and administration. Maintenance fees may address all aspects of capital costs including debt service, operations, maintenance, and repair and replacement of facilities. Unlike impact fees that are imposed on new development, maintenance fee revenue is generated from all development, existing and new. This stable revenue stream can support the issuance of bonds backed by the anticipated utility revenue. TischlerBise has completed three impact fee assignments for the District School Board of Pasco County, Florida. For the most recent update, TischlerBise revised the impact fee methodology to reflect more current pupil generation rates by type of housing unit, updated construction and land costs, level-of-service standards, and current revenue projections. In addition, TischlerBise worked with an advisory group made up of County and School District representatives, citizen groups, and the development community. The City of Port St. Lucie, Florida, retained TischlerBise to update impact fees for parks and recreation, public buildings, roads, and law enforcement. Proposed fees have consistent units and land use categories for all four types of infrastructure. TischlerBise also recommended fewer and more general land use categories that should make the impact fees easier to understand and administer. Proposed fees will cover the growth share of debt service payments, for infrastructure with surplus capacity, while providing additional infrastructure needed to accommodate new development. TischlerBise conducted an impact fee study and Capital Improvement Plan (CIP) for the City of Sandpoint, Idaho. Five fee categories were included: parks, police, fire, streets, and multi-use pathways. TischlerBise was hired to update the City’s existing program that did not account for variations by land use type. In addition with this update, TischlerBise included a progressive fee structure for residential units that varied the fee by size of housing unit. The fee schedule also promoted downtown development with a reduced fee to account for other tax-supported improvements. Finally, the fees included a new impact fee for multi-use pathways to support the City’s planning and mobility objectives. The study included extensive public outreach with the City Council and Advisory Committee. TischlerBise was retained by the City of Bozeman, Montana to update impact fees for the City’s fire, water, streets, and sewer infrastructure. Over the next decade, Bozeman is expected to experience an increase of approximately 3,800 housing units and 2.7 million square feet of non-residential floor area. Most impact fees decreased for residential land uses, in large part because of access to more detailed data and practical considerations in the impact fee methodology. For example, TischlerBise calculated Bozeman’s residential fees utilizing a tiered fee structure which accounted for the size of each housing unit. Persons per housing unit were derived from a logarithmic trend line fitted to U.S. Census data. TischlerBise recommended a minimum fee based on a unit size of 1,400 square feet and increasing in 200 square foot intervals to a maximum fee based on a unit size of 3,100 square feet or larger. This tiered approach results in a more equitable fee, as smaller housing units typically have fewer persons per household and generate fewer vehicle trips than larger units. For the sewer fee, TischlerBise isolated and considered data for homes constructed within the past 20 years, which were built with more efficient plumbing systems than older units. This enabled TischlerBise to calculate a significantly lower residential sewer fee, because new home construction will feature these more efficient systems. For the streets fee calculation, TischlerBise was able to more accurately reflect commuter patterns in the City and also accounted for decreased construction costs since the Great Recession. For the average 2,400 square foot home on a 6,000 square foot lot, total impact fees decreased by $2,500. City Commissioner Chris Mehl and Assistant Planning Director Chris Saunders praised the study conducted by TischlerBise, saying that the proposed fees are better targeted, taking into onsideration new components such as the number of people who occupy a housing unit and the size of the lot a home sits on. The Bozeman City Commission adopted all impact fees at 100% of the proposed fee amounts in early 2013. In the course of completing transportation fees for cities and counties throughout the continental United States, TischlerBise routinely works with private engineering firms and state transportation agencies, utilizing best available model data to tailor fee studies for each client. We have used transportation model data to derive average trip lengths for geographic service areas (e.g. urban vs. suburban) and to help determine the “growth share” of improvements to be funded with impact fees. A recent example of determining trip length by service area was the metropolitan area impact fee update that TischlerBise provided for the Regional Transportation Commission (RTC) serving Reno, Sparks, and Washoe County, Nevada. For RTC, we also demonstrated how urban areas have distinct demographic profiles and physical traits that reduce vehicle trips; design characteristics that promote walking and biking; and superior transit service. 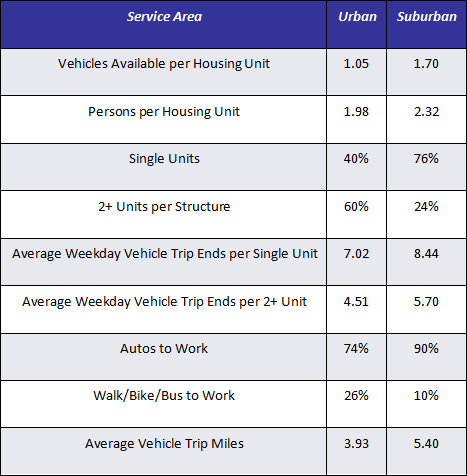 The table below summarizes results that TischlerBise obtained for RTC’s proposed urban and suburban service areas. TischlerBise has prepared impact fees for this community on three separate occasions. The fee categories include water, sewer, roads, parks, municipal facilities and storm drainage. As part of our first assignment, TischlerBise evaluated other revenue sources and developed a revenue strategy in which impact fees would pay for facilities required to serve new growth and supplemental sources would pay for new capital facilities benefiting existing development. There was no opposition at the public hearing and the fees passed unanimously. TischlerBise was retained by the County of Isle of Wight, Virginia, to review and analyze potential cash proffer funding to meet the demands for public facilities generated by new development in the County. Cash proffers are used in Virginia in a similar manner to impact fees to provide funding for growth related capital improvements, however cash proffers are voluntary and requested only on rezoning applications instead of all by-right development. TischlerBise reviewed and further evaluated the County’s existing cash proffer categories of public capital improvements: schools, parks and recreation, libraries, sheriff, fire and rescue, and general government and calculated new proffers for transportation and utilities. The cash proffer methodologies improved the County’s current adopted cash proffer policy by providing a better linkage between the demand for infrastructure from different types of land uses and the resulting costs. For instance, the cash proffer amounts for single family units are presented by size of unit, providing a more progressive program where smaller units that generate less demand would pay a lower amount. » Impact FeesTischler Bise, Inc.